In photography and image processing, color balance is the global adjustment of the intensities of the colors (typically red, green, and blue primary colors). An important goal of this adjustment is to render specific colors – particularly neutral colors – correctly. Hence, the general method is sometimes called gray balance, neutral balance, or white balance. Color balance changes the overall mixture of colors in an image and is used for color correction. Generalized versions of color balance are used to correct colors other than neutrals or to deliberately change them for effect. Image data acquired by sensors – either film or electronic image sensors – must be transformed from the acquired values to new values that are appropriate for color reproduction or display. Several aspects of the acquisition and display process make such color correction essential – including that the acquisition sensors do not match the sensors in the human eye, that the properties of the display medium must be accounted for, and that the ambient viewing conditions of the acquisition differ from the display viewing conditions. The color balance operations in popular image editing applications usually operate directly on the red, green, and blue channel pixel values, without respect to any color sensing or reproduction model. In film photography, color balance is typically achieved by using color correction filters over the lights or on the camera lens. Humans relate to flesh tones more critically than other colors. Trees, grass and sky can all be off without concern, but if human flesh tones are 'off' then the human subject can look sick or dead. To address this critical color balance issue, the tri-color primaries themselves are formulated to not balance as a true neutral color. The purpose of this color primary imbalance is to more faithfully reproduce the flesh tones through the entire brightness range. US Patent 2,850,563 states "...effecting a non-distorted transfer of a flesh tone through the system over its entire brightness range, notwithstanding the inherent non-linear transfer characteristic of said system...". Viewing of the flesh altered primaries is available with a /Color Separation Guide or Color Control Patch (same thing). There are 18 color swatches on the guide; 9 at 100% density, and the same 9 at 50% density. The 3-color swatch at 50% density thereon shows the result of the flesh tone primaries, at a 1:1:1 ratio, directly. Two photos of a high-rise building shot within a minute of each other with an entry-level point-and-shoot camera. Left photo shows a "normal", more accurate color balance, while the right side shows a "vivid" color balance, in-camera effects and no post-production besides black background. Most digital cameras have means to select color correction based on the type of scene lighting, using either manual lighting selection, automatic white balance, or custom white balance. The algorithms for these processes perform generalized chromatic adaptation. Many methods exist for color balancing. Setting a button on a camera is a way for the user to indicate to the processor the nature of the scene lighting. Another option on some cameras is a button which one may press when the camera is pointed at a gray card or other neutral colored object. This captures an image of the ambient light, which enables a digital camera to set the correct color balance for that light. There is a large literature on how one might estimate the ambient lighting from the camera data and then use this information to transform the image data. A variety of algorithms have been proposed, and the quality of these has been debated. A few examples and examination of the references therein will lead the reader to many others. Examples are Retinex, an artificial neural network or a Bayesian method. Color balancing an image affects not only the neutrals, but other colors as well. An image that is not color balanced is said to have a color cast, as everything in the image appears to have been shifted towards one color. [page needed] Color balancing may be thought in terms of removing this color cast. Viggiano found that white balancing in the camera's native RGB color model tended to produce less color inconstancy (i.e., less distortion of the colors) than in monitor RGB for over 4000 hypothetical sets of camera sensitivities. This difference typically amounted to a factor of more than two in favor of camera RGB. This means that it is advantageous to get color balance right at the time an image is captured, rather than edit later on a monitor. 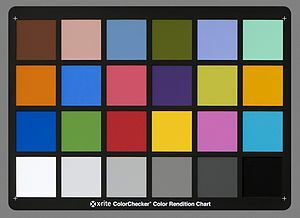 If one must color balance later, balancing the raw image data will tend to produce less distortion of chromatic colors than balancing in monitor RGB. Color balancing is sometimes performed on a three-component image (e.g., RGB) using a 3x3 matrix. 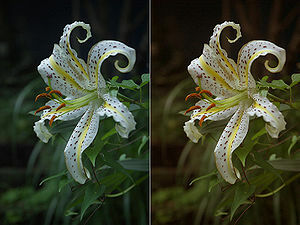 This type of transformation is appropriate if the image was captured using the wrong white balance setting on a digital camera, or through a color filter. was believed to be a white object, and if 255 is the count which corresponds to white, one could multiply all red values by 255/240. Doing analogously for green and blue would result, at least in theory, in a color balanced image. In this type of transformation the 3x3 matrix is a diagonal matrix. are the red, green, and blue components of a pixel which is believed to be a white surface in the image before color balancing. This is a simple scaling of the red, green, and blue channels, and is why color balance tools in Photoshop and the GIMP have a white eyedropper tool. It has been demonstrated that performing the white balancing in the phosphor set assumed by sRGB tends to produce large errors in chromatic colors, even though it can render the neutral surfaces perfectly neutral. are the tristimulus values of a pixel in the un-color-balanced image. Comparison of resulted colors as shot by the digital camera for different light qualities (color temperature): Neutral, Warm and Cold. Example of different white balance settings on digital camera for Neutral light. ^ Phyllis Davis (2000). The Gimp for Linux and Unix. Peachpit Press. p. 134. ISBN 978-0-201-70253-8. ^ Adobe Creative Team (2000). Adobe Photoshop 6.0. Adobe Press. p. 278. ISBN 978-0-201-71016-8. ^ Blain Brown (2002). Cinematography: Theory and Practice : Imagemaking for Cinematographers, Directors, and Videographers. Focal Press. p. 170. ISBN 978-0-240-80500-9. ^ Hsien-Che Lee (2005). Introduction to Color Imaging Science. Cambridge University Press. p. 450. ISBN 978-0-521-84388-1. ^ White Balance. Nikon Digital. Retrieved October 12, 2016. ^ Brian Funt, Vlad Cardei, and Kobus Barnard, "Learning color constancy," in Proceedings of the Fourth IS&T/SID Color Imaging Conference, pp. 58–60 (1996). ^ Graham Finlayson; Paul M. Hubel; Steven Hordley (November 2001). "Color by correlation: a simple, unifying framework for color constancy" (PDF). IEEE Transactions on Pattern Analysis and Machine Intelligence. 23 (11): 1209–21. CiteSeerX 10.1.1.133.2101. doi:10.1109/34.969113. ^ Heinz Terstiege (1972). "Chromatic adaptation: a state-of-the-art report". Journal of Color Appearance. 1 (4): 19–23 (cont. 40). ^ a b Gaurav Sharma (2003). Digital Color Imaging Handbook. CRC Press. p. 153. ISBN 978-0-8493-0900-7. ^ Sabine Süsstrunk; Jack Holm; Graham D. Finlayson (January 2001). "Chromatic Adaptation Performance of Different RGB Sensors". IS&T/SPIE Electronic Imaging. 4300. ^ Laurence T. Maloney; Brain A. Wandell (1987). "Color constancy: a method for recovering surface spectral reflectance". In Martin A. Fischler; Oscar Firschein (eds.). Readings in Computer Vision. Morgan-Kaufmann. ISBN 978-0-934613-33-0. ^ a b "photoskop: Interactive Photography Lessons". April 25, 2015.